Critically acclaimed Japanese film director, producer, screenwriter, animator, author, and manga artist, Hayao Miyazaki is no stranger to original, vibrant and brilliantly animated masterpieces. However, like in the case of many artists, outside inspiration inevitability inhabits his sphere of creativity from time to time. These instances filled with foreign inspiration are most noticeably portrayed in his animated film, Nausicaä of the Valley of the Wind (1984) (風の谷のナウシカ), a post-apocaplyptic tale of a young princess who becomes intwined in a struggle with Tolmekia, a kingdom that tries to utilize an ancient god to eradicate a poisonous jungle filled with giant mutant insects. 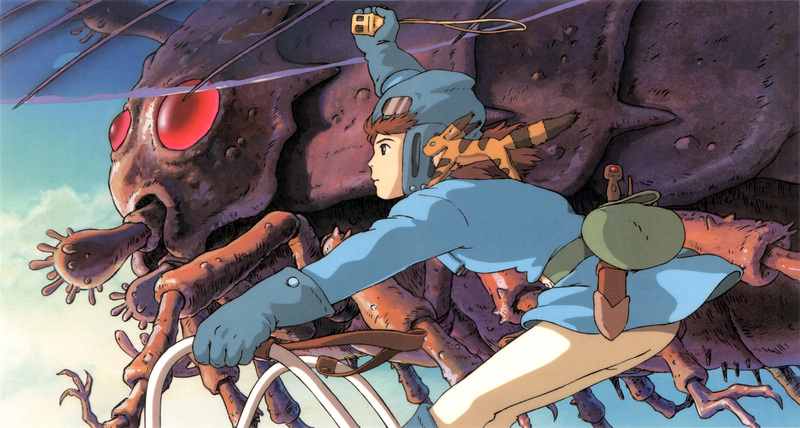 The foremost connection between Miyazaki’s film and Greek mythology is indeed the main character. It is not by pure coincidence that the main character identifies with the same name as the Phaeacian Princess Nausicaa (Ναυσικάα or Ναυσικᾶ) from Homer’s Odyssey. The bank of contemporary literature and entertainment that centralizes on Nausicaä is quite minuscule; it would be unbelievable to assume the inspiration sprouted from any other origins. 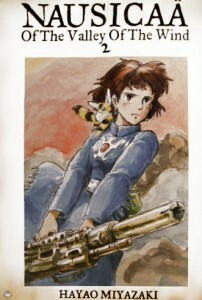 In fact, Miyazaki first came across Nausicaä in Bernard Evslin’s Japanese translation of a dictionary of Greek mythology and fell in love with the character portrayed. Naked as he was. What choice did he have? And the girls flutterd off into the jutting beaches. Put courage in her heart and stopped her trembling. The way to the city and give him some clothes? While the other servants are scared away by Odysseus’ sudden appearance, Nausicaä, instead of running away, offers Odysseus clothes and leads him to the edge of the town with her mule cart. 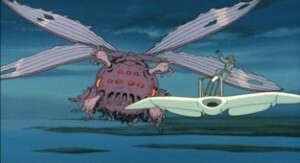 The mutant insects in Miyazaki’s film, like Odysseus, are ugly and disfigured monsters that become scared and helpless when they “wash” up on the shore of human civilization. While everyone else is horrified of these creatures, Nausicaä is the only one who feels sympathy towards them and has the courage to lead them back home to the Toxic Jungle. Although Miyazaki’s Nausicaa isn’t riding on a modest chariot (she has a handy air glider instead), Nausicaä excels in aiding both the homecoming of Lord Yupa to the Valley of the Wind as well that of ohm back to its home in the Toxic Jungle. Again, later in the film, with her soft words and bug charm (knick knack she carries around to communicate with bugs), she soothes an outraged, frightened and injured insect found in the destroyed Pejite plane and follows the bug home all night until it returns safely to home (To watch this particular scene click, here. Sorry, no youtube video available). In both Homer’s and Miyazaki’s version, Nausicaä is an invaluable asset and guidance to those searching for their way home. I think you are most like great Zeus’ daughter Artemis. Artemis, being the goddess of wild animals (that includes insects; they are animals too), provides Hayao Miyazaki a perfect pathway to integrate other outside influences into his character. Specifically taking this opportunity to integrate the characteristics of the protagonist of a twelfth-century Japanese tale called The Lady who Loved Insects (虫めづる姫君), Miyazaki provides his Nausicaä with the same ability of befriending insects that the protagonist of the Japanese tale has. By doing this, Miyazaki combines disparate inspirations and takes three seemingly different characters (Nausicaä, Artemis and The Lady Who Loved Insects), ultimately merging them into one engaging protagonist in his film. While Miyazaki’s Nausicaä isn’t a carbon copy of the one Homer describes, and Miyazaki took many liberties in his creation of Nausicaä, his film is another token representing how Greek mythology continues to be a source of inspiration and a vital asset to the creative minds in the entertainment industry. Because myth is so diverse and widespread, it is possible for Miyazaki to treat myth as a buffet where he can take as much or as little of what he wants. Furthermore, he can combine what he chooses and mix it with his own personal philosophies and Japanese culture, stories and even mythology. 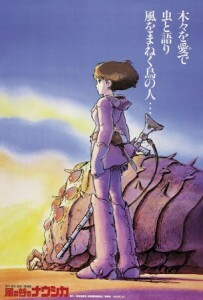 In addition, while Naussica isn’t the most prominent character through Homer’s Odyssey, the sheer fact that when “Nausicaä” is typed in Google and Miyazaki’s film appears first, whereas Homer’s Nausicaä is secondary, proves that Miyazaki’s revival of this myth ultimately credits myth’s ability and nature to last and mutate through time. This entry was posted in Uncategorized on May 2, 2015 by arhawk. Having seen the movie, I can say that I really enjoyed your analyses of Nausicaa you present. This trio of literary characters you identify as serving to create Nausicaa, I think, fit very well with who the Princess is. I have never read the story of The Lady who Loved Insects, but just from the name I can understand how this story was crucial for creating Nausicaa, she will go to any lengths to protect the forest creatures. The name parallel had always struck me as kind of funny, I knew that it was Greek related, but not until reading your post did I make the connection back to The Odyssey. Nausicaa as a character in the epic poem is there for only a few scenes of the epic, and yet I can see how, through your analysis, the character of Nausicaa in Miyasaki’s film embodies her and makes her much more than just the compassionate care giving princess we see in The Odyssey. I really enjoyed your analysis of the kindness and the care giving aspect of both characters. You also articulate very well just how Miyasaki develops his Nausicaa well beyond anything we see in the Odyssey. 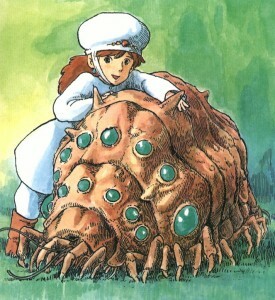 She develops as a dynamic female and ruler, unlike the other Nausicaa, granted we don’t get to see a whole lot of her. Lastly, I think you hit a very important point in addressing the mutability of myth, not just Greek myth, but all mythic tales. They are constantly being reworked and reused to tell new, more exciting stories. This is a key part of Miyazaki’s work, I think. His stories are so very unique and yet, as you have showed here, they are inspired in many aspects by other works from Greek to his own native Japan. Overall, I thing a very thoughtful analysis. Thank you for sharing this and bring it to the forefront, because just like me, it’s something most people really don’t think about, the origins for the stories they are so in love with. It’s fascinating how myth manages to define and shape out contemporary pop culture to a certain extent. I mean, sure ancient myths make for great movies and action-flicks. But even more fascinating to me is just how often they pop up in comics. I mean, it makes sense that comics would try to create their own interpretations of these action-packed and intricate myths, but it’s just crazy how often it pops up. It’s in Marvel comics, DC comics, and now even in the legendary Miyazaki’s manga/animation. What’s even more fascinating is the balance between the originality of these characters as creations of their authors and the influence of the Greek myths. If nobody knew about the mythical Nausicaa then they’d just assume that this was something completely original from the brilliant mind of Miyazaki, when in actuality it’s both original and not. The idea for the interpretation is very original and this reincarnation of Nausicaa is Miyazaki’s own, but the influence and concept of Nausicaa is not his own.